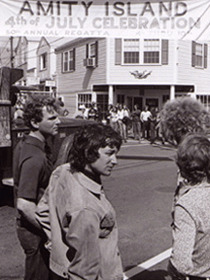 There are bookshelves stuffed with behind-the-scenes memoirs and photos from the making of movies, but few are as comprehensive (and interesting) as Jaws: Memories from Martha’s Vineyard. The oversized book, packed with thousands of images, tidbits of trivia, and interviews, tells the story behind the making of one of the 20th century’s most iconic movies, but, in a unique twist, from the perspective of the locals. 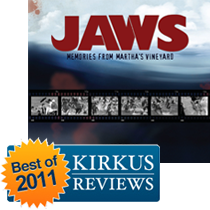 JAWS Memories From Martha’s Vineyard featured on Quint’s Holiday Gift Guide 2011 – Part 2! Books, Comics, Music and Food! on Ain’t It Cool News. If you only pick up one book from this list this is the one it should be…. It’s a huge, heavy book and is one of the very best Making Of books I’ve ever read. Mike Rogers reviewed the book for the Library Journal. The book is chock full of anecdotes and is bursting with more than 1000 pix shot by residents that have never been seen before. 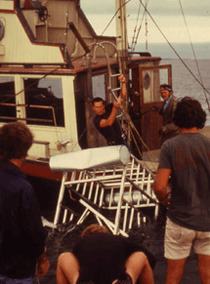 If you’re a JAWS nut, then you’re going to need a bigger book shelf, because this behind-the-scenes beauty is an absolute must have. 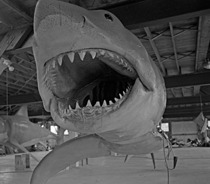 I’ve got the paperback edition, but there’s also a killer deluxe boxed Limited Edition hardcover with a DVD containing 8mm behind -the-scenes footage of the JAWS production, which was shot and narrated by Islander Carol Fligor, plus a 1″x1″ piece of the fiberglass hull of the Orca II (a.k.a., sinking Orca) used in the movie with a note of authenticity from owners Lynn and Susan Murphy (how freaking cool is that!). Read the full review at Library Journal. 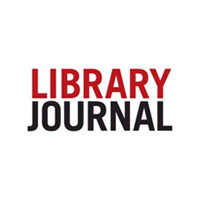 And see more from the Library Journal here.